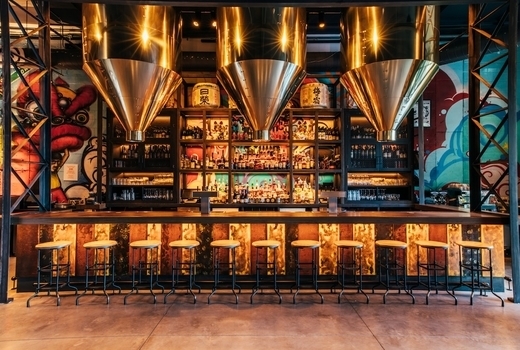 Awash in rich copper, deep indigo, and custom art installations by Ewok One, Rice & Gold is the toast of the New York City culinary scene nestled inside the trendy Hotel 50 Bowery. 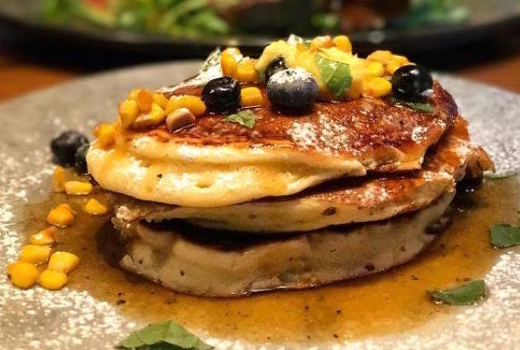 Grab your $45 pulse (a $90 value) for a magnificent bottomless brunch for two, that includes 2 Entrees and 2 Hours of Unlimited Brunch Cocktails. 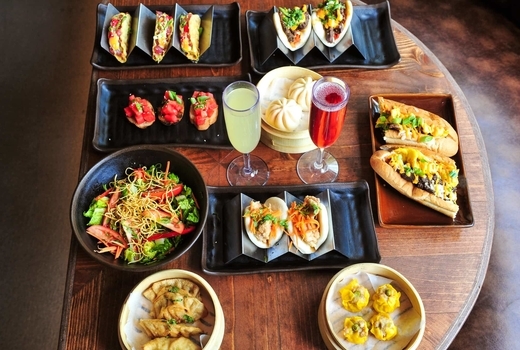 In the hands of a dream team from Two Roads Hospitality Group, brunch becomes a culinary theater where Asian flavors collide joyfully with American comfort! 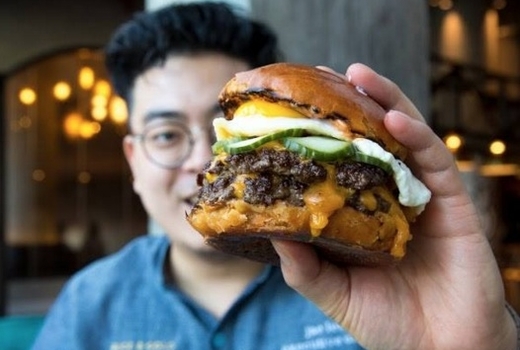 Entree choices include the towering Hangover Sandwich (soft scrambled egg, cheddar, hash brown, applewood smoked bacon, brioche, waffle fries) punched up with bright Sriracha ketchup, or the cult-hit Bacon, Egg & Cheese Fried Rice topped with garlic, chili and crispy scallions. 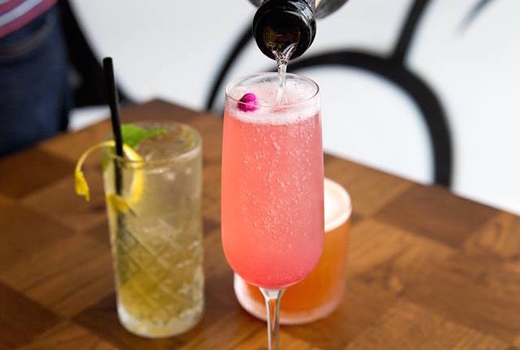 Not to be outdone, craft brunch cocktails like the Yuzu Mimosa and the Cherry Screwdriver take your brunch to the next level of deliciousness. Following the meteoric success of groundbreaking institutions Massoni and The Crown, Two Roads Hospitality Group present Rice & Gold, a novel concept restaurant with a sophisticated global flair. 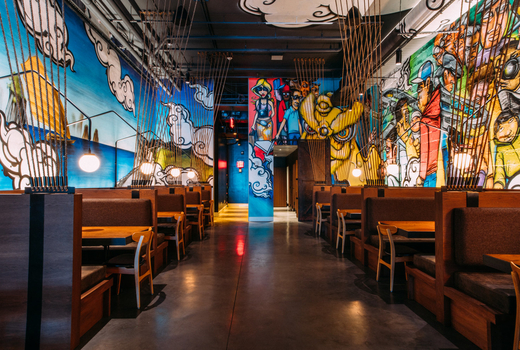 The colorful murals, polished brass pendants and comfortable banquettes supported by cable-suspenders pay homage to the vibrant metropolises of the East and the West. Try the Kimchi Brisket Ramen - a savory rice noodle soup with juicy Peking brisket, sesame bean sprout and soy marinated egg. If you're craving something fresh, the Avocado Toast (grilled sourdough, heirloom tomato, fried egg) is a healthy and no less mouthwatering choice. 2 Brunch Entrees (choice of Sandwiches, Plates, Rice & Noodles). 2 Hours of Unlimited Brunch Cocktails (Rice & Gold Bloody Marys, Yuzu Mimosas, Cherry Screwdrivers). "Used a pulsd deal to have brunch here and really enjoyed it. Yuzu mimosas were great and the peanut butter jelly rice balls were awesome." "Cocktails are awesome. Food is amazing. Service is the best. The chef was in the kitchen when we were there and even came out to some tables. Best food we had: Pho Soup Dumplings, Shrimp and Bacon Shumai. Pork buns were nice to have on the side." "Enticing menu. Food was excellent with super-high quality ingredients. Pea shoots were amazing. Lamb buns were killer." May combine up to 5 vouchers per table.